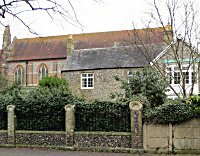 Up until 1840 anyone in the village of Milton wishing to attend church faced a two mile walk across open farm land in order to reach St. Mary's, Portsea, but on Monday 13th July 1840 the foundation stone for the first church in the village was laid by the Rev. C. B. Henville, formerly Vicar of Portsea. Curiously the new church was dedicated to St. Luke, but by the time the church was consecrated on 30th September 1841 this had been changed to St. James. Under the foundation stone there were placed several coins of the era, by the Rev. J.V. Stewart, and a series of metallic casts of the Ecclesiastical and Municipal Seals of the Borough by Henry Slight Esq. The church itself was described as being built 'in Romanesque style, with a semi-circular chancel and a bell tower at one corner'. It was constructed on land donated by Admiral Sir Philip and Lady Anne Henderson Durham (see photo right). It was small but could easily accommodate the entire population of Milton and this intimate atmosphere appealed to couples who lived in the densely populated areas of Portsea Island and many opted to be married there. It was, as a consequence, often referred to as the "Runaway Church". For the first few years after consecration St. James's Church was under the control of a curate, Henry Holloway, as no vicar had been appointed. This was to change in 1844 when the Rev. Herbert May took up the post but both he and, initially, his successor Richard Burridge (appointed 1850, aged 33 years) had to find accommodation in a cottage in the village. 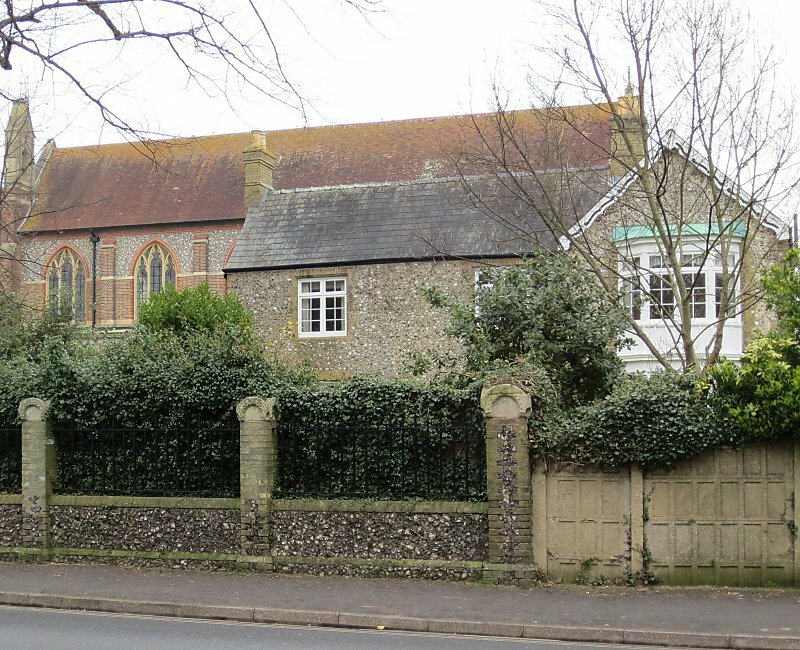 A vicarage was built next to the church in 1852 which meant that Burridge could enjoy the convenience of living next to the church for the remainder of his incumbency and of his life as he died unexpectedly in 1859. A complete list of the Vicars of St. James's Church can be found elsewhere on this site. Almost immediately after the consecration of St. James's a second site for Christian worship opened in Milton. In 1842 the Congregational Chapel which was built almost opposite St. James's adjacent to the modern location of the public library. Many historians say that James Goldsmith donated the land for the erection of this church but he did not acquire the property until at least 1855. Prior to that the land was owned by the Leggatt family who should be remembered rather than Goldsmith. The church was founded by David Knight, a master baker, former policeman and strict puritan. It seated 200 people and cost £300. A Mr. Theophilus Kendall, from Northern Ireland took charge of the chapel and was paid seven shillings and sixpence. He was said to be a very saintly man as well as an accomplished painter who died, according to his friends, of malnutrition soon after taking up his post. 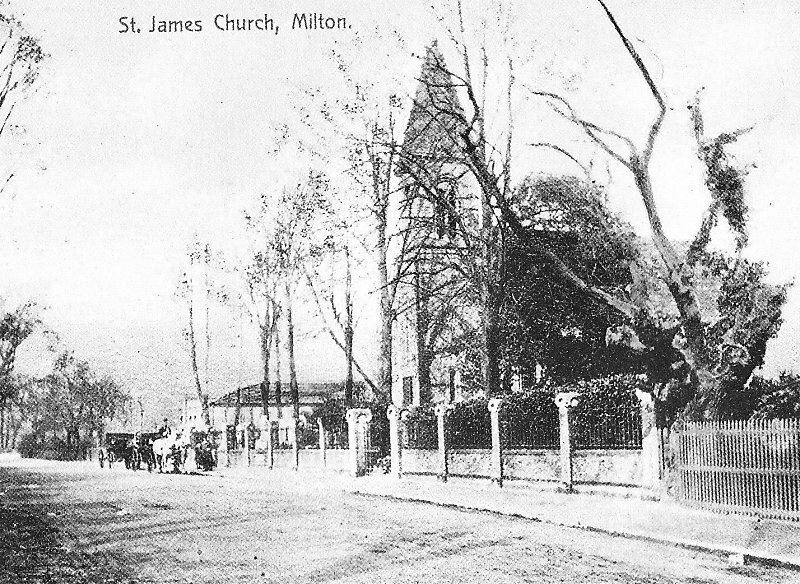 The second half of the 19C saw the population of Milton rising slowly but still being ably served by the two churches on Milton Road but in 1911 the major landowner in the area, James Goldsmith died and much of his land was sold to housing developers which led to a rapid expansion in the numbers of people living in the village. One effect of this was to render the church of St. James too small. The original church was therefore demolished and a larger replacement built in it's place though not on quite the same footprint. The first church had been orientated east-west with the bell tower just a few yards from Milton Road, whereas the new one was set much further back and turned through 90 degrees to lie north-south. 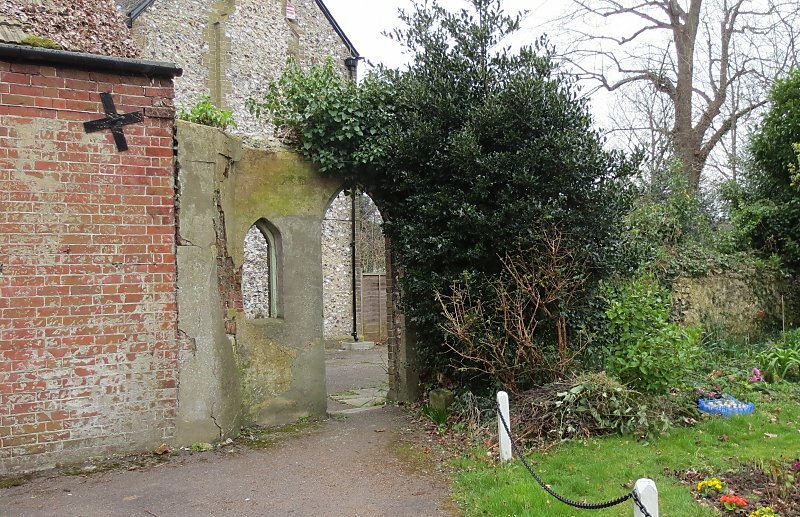 Part of the south wall of the first church survived the demolition and can still be seen on the south side of the current churchyard. The new church, built to a design by architect John Scott, was 'Gothic in form, austere and plain, but with a dignity of form'. The exterior was a mixture of brick and flint whilst internally the brick is carried through and offset against dark coloured timber. It was originally known as the Bernard Wilson Memorial Church after a respected vicar of St. Mary's. 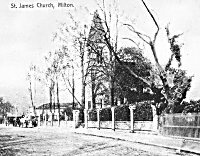 Meanwhile the Congregational Church had been extended by the addition of a kitchen at the rear in 1903 but it too was proving too small and so in 1913 a larger church was built on the other side of Milton Road, between Warren Avenue and Edgeware Rod. It was named the Kendall Memorial Congregational Chapel after Theophilus Kendall. 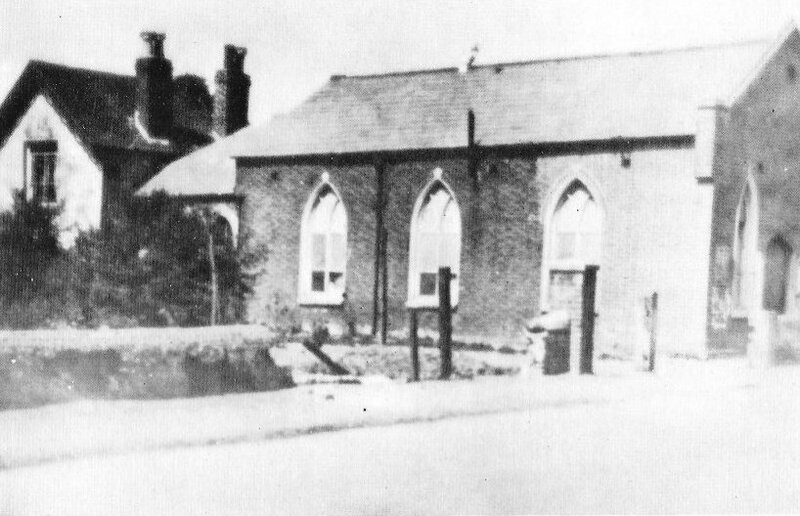 The original chapel later became the Milton Community Centre. The new church was bombed during WW2 and wasn't replaced until 1955. In 2010 it was renamed the Christ Church Milton United Reformed Church.